It’s no surprise that kale has slowly become the go-to ingredient for green smoothies, juices and shakes. Perhaps a bit too much hyped up as a super food, kale does actually have some amazing and unique health benefits. But unless you have a powerful blender at home, such as a Blendtec or a Vitamix, kale is not always the easiest of ingredients to blend into a delicious smoothie. Read on to find out how to blend kale into a nutritious drink with a creamy, smooth texture. There are several varieties of kale but the two most common ones are Curly kale and Lacinato kale, otherwise known as Dinosaur kale. What these two types of kale have in common is their sturdy stems that are really difficult, if not impossible, to blend. The leaves of kale are also quite tough to break through. Whenever you buy a kale green smoothie outside, chances are it hasn’t been blended properly. It will likely have a few leafy chunks of kale in there, which is really not what you want to see in a green smoothie. Blending should always result in a delicious drink with a creamy, smooth texture without any chunky bits and pieces floating around. If you have a relatively basic blender at home, you will probably encounter that very same issue when blending kale or any other tough vegetable. You could of course get a fancy Vitamix that can pulverize literally everything, but they are quite pricey. And that price tag isn’t always justified, especially when you don’t use the blender on a regular basis. Don’t pick the first bunch of kale you come across, as some bunches are a bit softer or riper than others. I also find curly kale to be a bit softer and therefore easier to blend than Dinosaur kale. A Vitamix can blend even the stems, but otherwise it’s best to cut them off. The stems don’t contain the most nutrients anyway, so you won’t miss out on much. If you really do want to blend the stems as well, cut them in tiny chunks before placing them in the jar. This will make life a lot easier for your blender. Place a softer ingredient, such as bananas, in you blender before the kale. Also add a few cups of water or other type of liquid. This will allow your blender to “warm up” and will prevent kale leaves to get stuck in the bottom of the blender container. Place ice cubes on top to put some weight on it. I’ve heard and read others saying that you need to put the kale in first, but I personally haven’t found that to be the most effective approach. Steaming or cooking kale for just a few minutes will make it a lot softer and easier to blend. Don’t cook it for too long though, as you don’t want to sacrifice too much of the nutrient content in the kale leaves. Although it may not sound too obvious, frozen kale is actually easier to blend than fresh kale from the store. 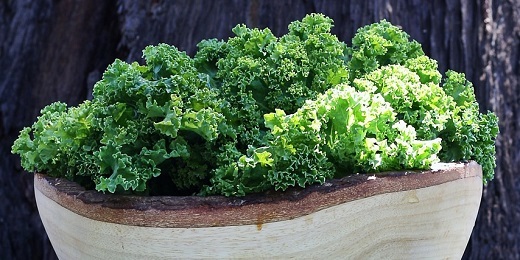 The other benefit of freezing kale is that you can keep it for much longer. >> Check out my favorite blender on Amazon. I absolutely love adding moderate amounts of kale and spinach to my green smoothies. Here are a couple of my favorite recipes. Two of my favorite greens, kale and spinach, combined with one of my favorite fruits, avocado! This recipe is an absolute winner when it comes to nutritional benefits. To add a bit of sweetness to this otherwise very green recipe, I usually add one or two bananas and juicy watermelon. Strawberries are optional, if you want to balance out the vegetable content even more. The “Afternoon Booster” as I’d like to call this recipe, is a delicious drink that combines the goodness of kale with green tea. Not the most obvious combination, I know, but it’s oh so good! The honey and lime give this smoothie a tangy flavor, perfect for in the afternoon when you need to stay focused. There’s no denying that kale is an amazingly healthy vegetable. But we should also not get too excited about just one type of leafy green, even if we hear so often that kale is the new modern day super food that will make us all healthy overnight. The number one rule with blending is to mix up the ingredients. Each vegetable and fruit has its own perks and health benefits. Therefore it’s important to always consume different types of leafy greens in order to get a great variety of nutrients in. Vegetables also have a built-in self-defense mechanism. If you eat too much of the same vegetable each day, it can actually make you sick. This mechanism keeps the vegetable happy, but also us because it forces us to mix it up a bit. Hopefully the above tips will make it easier for you to blend kale into a delicious and nutritious green smoothie. Be sure to check out some of my green smoothie recipes and tips! I would like to know recipes for kale and weight loss. Hi Lenore, do you have a blender? Have a look at these delicious kale smoothie recipes. Otherwise check out this link for some great recipe ideas with kale.